Since almost forty years z'ev belongs to the absolute fore front of experimental music. Playing percussive music he gained a lot of attention, but in more recent years he returned to working with electronic tape manipulation. One aspect is working with other people, such as Francisco Lopez or Kasper Toeplitz. On 'Forwaard' he uses field recordings made by Frans de Waard (hence the title), which are 'recoded' by z'ev into a forty minute, densely layered pattern of musique concrete. Many of the water like sounds disappear in the 'recoded' version and makes a particular strong work. The cover contains field photography Frans de Waard and was designed by Meeuw Muzak. It comes in the 15x15 cm cover that Korm Plastics has used before. Meanwhile Z'EV's Forwaard (KORM PLASTICS KP3029) appears to be a set of electronic suites based on samples of extant works by the great Frans, housed in a slightly outsize cover depicting still-life foliage in deepest green on the front, and a puzzling what-is-it image on the back which might be old carpets rolled up and inserted in some secret caves in Palestine. Brief spins reveal a quieter side to this ear-ringed percussive fellow, in distinction to his usual 'wilder' self. Hidden between two thoroughly minimally designed 6 by 6 inch pieces of cardboard is a CD by Z'ev entitled 'Forwaard'. The fourty minutes of sound-art were generated by Z'ev with the use of sound recorded by Frans de Waard (known from his musical activities under the names Kapotte Muziek, Wander, Beequeen, Goem and mony more). The result is a multilayered piece of music with many influences. It can not truly be labeled one style, allthough the website of Korm Plastics uses the words "a densely layered pattern of musique concrete". 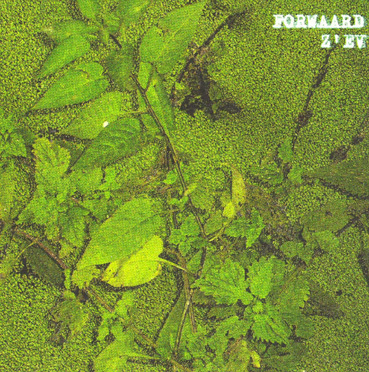 'Forwaard' has many faces, which makes it a very worthwile release. It's part musique concrete, part droney ambience, part noise (albeit very, very subtle) and part experimental. While listening to the music, you enter a strange time/space continuum, which makes the whole CD seem to be longer then it actually is. After several listenings, it's still unclear to me if this is because of the used sources, or the recoding and rearranging of sounds. In Holland there is a saying 'Goede wijn behoeft geen krans' (a good wine doesn't need to be crowned with laurels) and that is exactly what fits this release. Don't talk too much about it, just sit back, pour a glass of wine and enjoy the sounds. While Z'EV gained a lot of attention through his percussive music in the 1980s, the focus of his interest has shifted towards the manipulation of field recordings in recent years. 'Forwaard' is based on recordings provided by Frans de Waard. Sounds of rain and running water keep recurring throughout the piece, and the static, yet internally richly structured quality of these sounds is indeed an overall characteristic of this work. Avoiding a dramatic build-up or noisy peaks, Z'EV weaves a dense organic composition from obscured field recordings and meandering metallic overtones. Everything is moving at a slow pace, but there is constant movement and over the course of some 40 minutes a richly varied tapestry of drones unfolds, evoking a calm late-night atmosphere, in which objects appear only as silhouettes and gain a delicate, soothing presence, albeit not devoid of some dark undercurrents.